This new bug screen is a truly upper level accessory especially designed to give your Prowler protection against bugs, stone virtually any foreign road debris that up until now was not available unless you would strap an unsightly screen to the front of your beautiful car. Its frame is constructed of top of the line 304 stainless steel and the screen is of a very durable fiberglass screen mesh. Your new screen comes to you with a protective liner. Do not remove liner until prompted by instructions. 1. Remove the three factory screws securing the black metal grille cap and set aside. Remove the two left and right screws just above the bracket as well. NOTE: These screws will not be reused. 2. 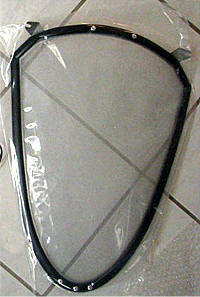 It will be necessary to shape (Bend) the part in order to allow you to slip the unit down behind the factory grille. Remove the clear protective liner from the frame if there is one and insert the unit. Once the frame has been inserted you will notice that the two slotted tabs will also need to be tweaked so that they closely match the screw platform. You can do this with needle nose pliers until you get the tabs to align very close. The tabs do not need to be perfectly matched to the screw platform but just closely aligned. 3. Once you have the frame set into place and have got the tabs nicely adjusted replace the factory grille cap by slightly bending the screen when slipping it into place. Align the holes. You have been supplied with two chrome screw covers and sockets as well as two replacement screws. Insert the screws though the white nylon sockets and secure the top plate at both the right and left locations. Then snap the two chrome screw covers in place to finish the installation.